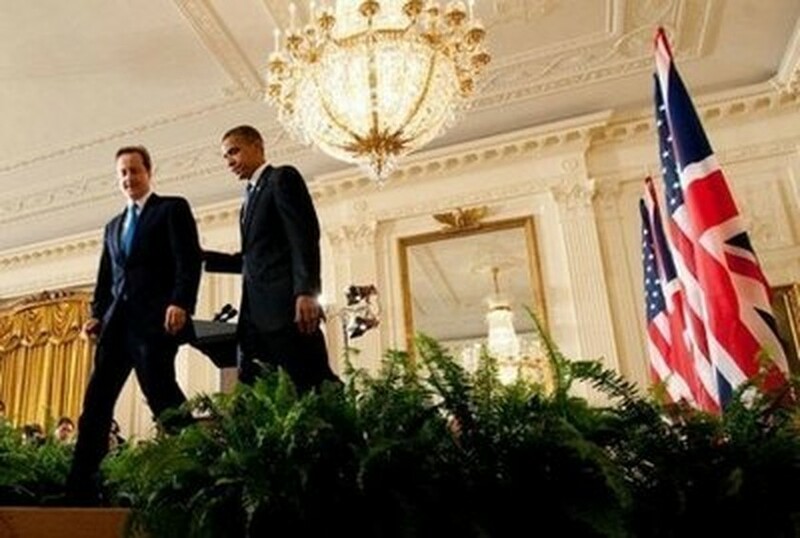 British Prime Minister David Cameron and President Barack Obama sidestepped political minefields over the BP oil spill and the Lockerbie bomber and insisted Afghan war strategy was working. In their first White House talks, the two leaders also pledged fealty to the "special relationship" between Britain and America, and sought to forge a personal connection in a White House press conference. In fact, the visit appeared planned by both sides to ensure that the first real chance for the two to bond -- after brief previous meetings -- was not spoiled by political rows neither could control. Obama hosted Cameron for talks in the Oval Office, served a lunch of wild striped bass, and gave his guest a tour of the White House living quarters. Cameron even remarked on the Obama daughters' tidy bedrooms. Cameron had arrived in Washington amid signs that his visit could be overshadowed by still simmering political fury here over a mass casualty terror attack two decades before he took office. Scotland's devolved government last year released Libyan Abdelbaset Ali Mohmet al-Megrahi -- the only man convicted in the 1988 Lockerbie bombing -- on compassionate grounds after he was diagnosed with terminal cancer. But Megrahi, the only man convicted over the downing of the Pan Am jumbo jet, which killed 270 people, is still alive in Libya, sparking fury among Americans who believe he should never have been released. Cameron's strategy was to forcefully condemn the release of Megrahi, and to offer sympathy to enraged Americans. But he also rebuffed US calls for a British government inquiry. "I said this a year ago... it was a bad decision, it shouldn't have been made," said Cameron in the East Room press conference with Obama. "He showed his victims no compassion. They were not allowed to die in their beds at home, surrounded by their families; so, in my view, neither should that callous killer have been given that luxury." However, he added, "I don't need an inquiry to tell me what was a bad decision." Cameron did tell his top civil servant to go back over the paperwork on the decision, and to see whether more should be released. In return, Obama stopped short of calling for an official British government inquiry, stating his own personal anger at the Megrahi release, but expressing confidence Cameron could produce the facts of the case. Cameron also defended British-based BP, following claims by US lawmakers that the energy giant -- already a pariah in America over the Gulf of Mexico oil spill -- lobbied for Megrahi's release to ease business ties with Libya. "That wasn't a decision taken by BP -- it was a decision taken by the Scottish government," Cameron said. The British leader, carefully noting US anger over BP's role in the Deepwater Horizon oil spill, said he fully agreed with Obama that BP needed to seal the ruptured well, clean up the spill and compensate victims. But with an eye on the British-based firm's role as a provider of thousands of jobs in the US and British economies, Cameron said the energy giant must be kept "strong and stable." Obama and Cameron also paid mutual tribute to US and British soldiers killed in the Afghan war, and insisted their military plan was working. "We have the right strategy. We're going to break the Taliban's momentum. We're going to build Afghan capacity, so Afghans can take responsibility for their future," Obama said. Obama, who mandated a surge of US forces last year, has said he wants to start bringing home at least some troops in July 2011. Cameron wants British combat troops home within five years. But critics have expressed doubts that the newly trained Afghan army will be in any shape to keep the peace by 2014. "I think it is realistic," Cameron insisted on NPR Tuesday. "Remember, 2014 is four years away, so there's quite a lot of time to train up that Afghan army, and that, to me, is the most important thing." Obama and Cameron also discussed the case of Gary McKinnon, a Briton with Asperger's syndrome whom the United States wants to extradite for hacking into US military computers. Cameron has previously condemned the extradition request, which could see Mckinnon serve decades in US jail. Obama said he could not get involved in such legal complexities but added his team was working on the case, and both sides expressed hope of finding a way forward.